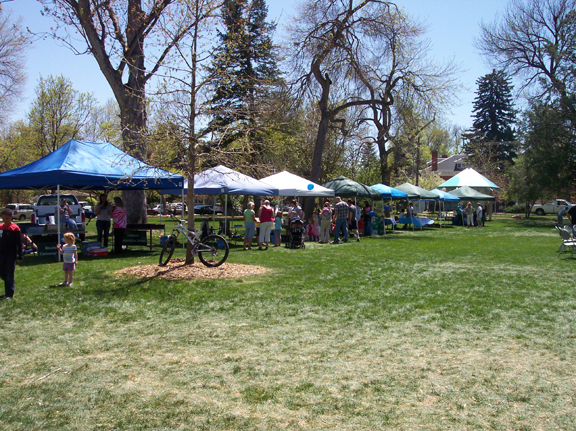 Took the girls to the local Earth Day celebration today. I have avoided such events in the past, because of the crowds, and the way you have to park forty miles away and hoof it in. I know I need the exercise, but if I wear myself out just trekking to the thing, then have to fight the crowds to get to the booths, well, then what’s the fun in that? That’s the advantage of living in a smaller place. Although our city is 86,000 people, it feels small. Events are on a manageable scale, and usually there aren’t too many lines or if there are, they are short. 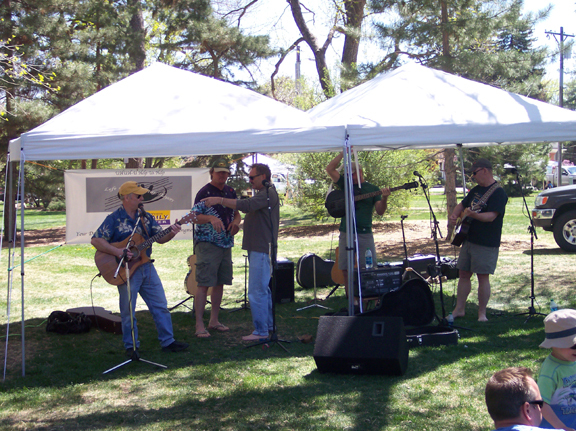 Our Earth Day celebration took place in one of our city’s 34 parks (yes, THIRTY FOUR). It was near downtown, and is the park that has recently had a new playground installed. It is one square block, and understand that blocks in this town are small. There were a few booths set up (less than a dozen), a giant inflatable globe, and a huge drum circle set up in the middle. 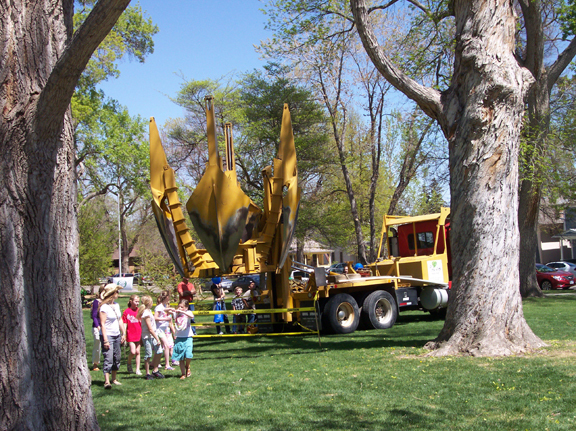 The city forestry people had set up their tree planter, and were letting kids play around with its controls, short of actually digging a hole. The municipal power people had a booth, and one guy was doing his best Fire Marshall Bill impression with big gloves and a live set of miniature electrical lines meant to simulate power lines. He took turns either burning up a plastic figure of a little boy “flying a kite” or electrocuting a branch from a tree (that was supposed to represent a tree). He was having a grand time, and the kids were enthralled. There were booths giving away seeds, helping kids build noisemakers, another booth on our county’s recycling program (we have great single-stream curbside recycling here as part of our very cheap trash service), and a guy using a lathe to make these fantastic wooden bowls. There were tightropes the kids could walk, as well as Jacob’s ladders they could climb. 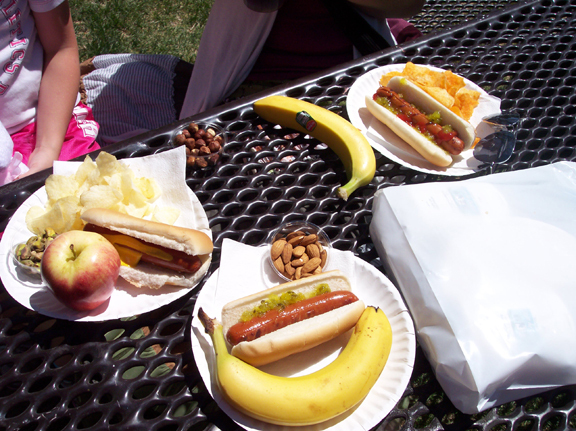 There was a meal of hot dogs, bananas, and nuts ($2 per person), and a band of four guys on guitar singing some Southern rock and 70’s classics. 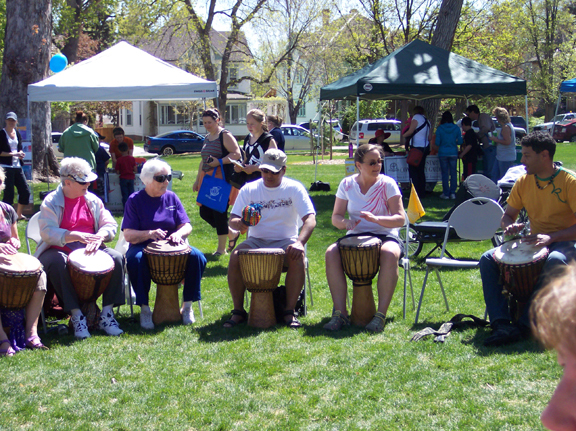 Then there was the drum circle. I have not been drumming since I left Missouri, having not found a group in my town (or close by). 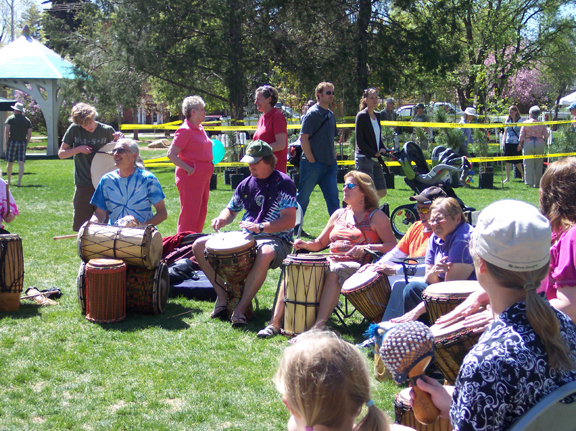 Well, it turns out there’s a guy that hosts a drum circle very close by, in the next town over, about 3 miles or so from my house. He also teaches drumming in my town. 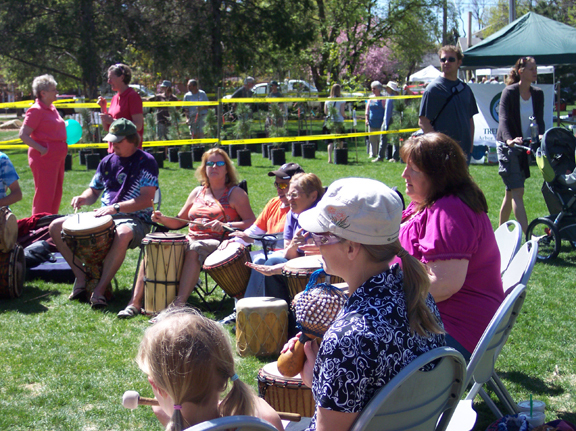 He had brought a Subaru full of drums, and set them out, and people just gathered in, grabbing a drum and going for it. What surprised me was the flock of old people drumming right along. I’m talking the senior crowd, 70 and up. There was a guy sitting next to me who had brought his own chair and his own drum, and wow, was he good! I grabbed up a drum and joined in, although I wish I’d had my own drum instead. My Ashiko was custom-made for my height and my hand size, and I love it. But the drum I had, an oversized Djembi, had a great sound, and I had no trouble keeping up with the drummers there who appeared to have a lot more experience than me! It’s always been hard for me to describe how drumming makes me feel, but I can tell you that when I was done, my whole body was buzzing and I felt so good. I probably only drummed for about a half-hour, but it was enough. 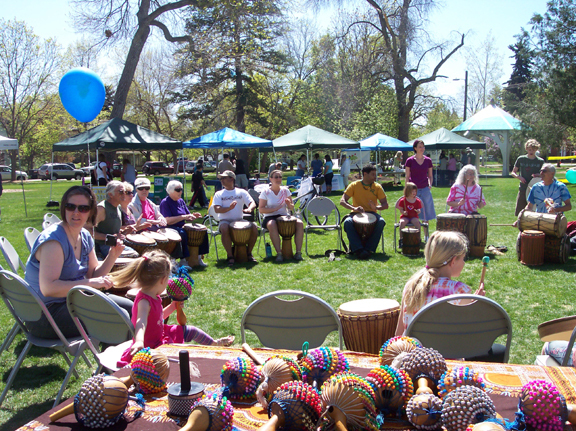 And now I’ll have a drum circle I can go to regularly, which is going to be wonderful. It was a wonderful way to spend our day. The fact that it was relatively low-key was great for me, and for my rather over-excitable Tater. Things may not always be perfect in my world, but there are so many good things that I cannot help but to feel blessed. 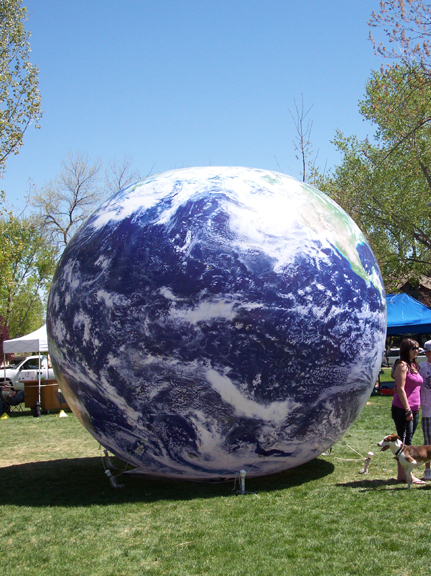 It wouldn’t be Earth Day without a globe, right? 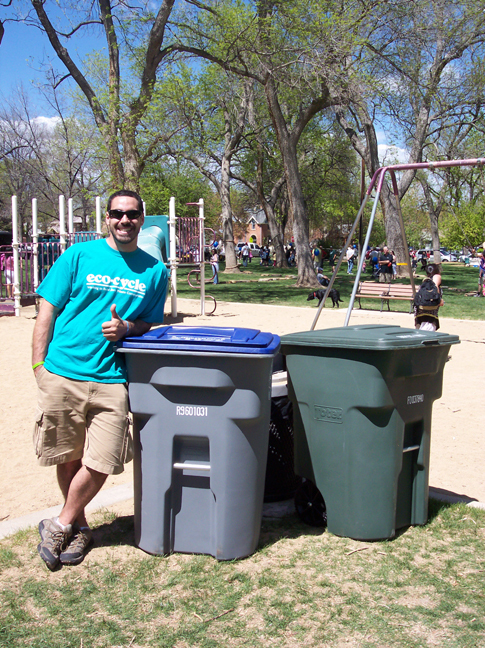 They had people stationed at every trash can/recycling station to make sure you put your stuff in the right container. This guy was cute, according to The Perfect Child. The band playing Southern Rock and 70’s hits. 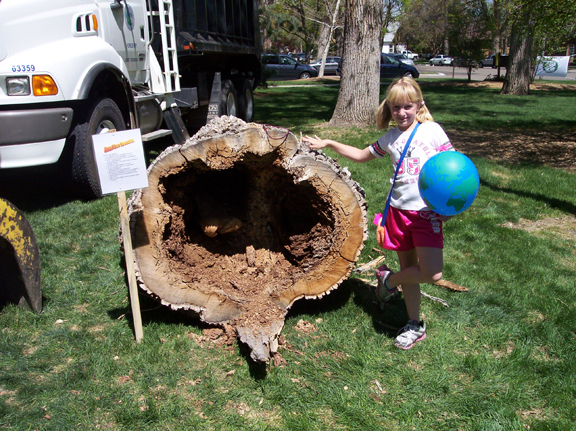 Sample of a rotten tree removed from the park. Look at the old ladies drumming! And they knew what they were doing, for sure. The guy on the left in the blue starburst shirt is the guy who runs the drum circles nearby. That’s me, on the right. The Perfect Child took this shot. I like the contrast of the hand rattles in the foreground. What a great picture! This entry was posted on Sunday, April 22nd, 2012 at 8:38 am	and is filed under Uncategorized. You can follow any responses to this entry through the RSS 2.0 feed. Both comments and pings are currently closed. Love that last shot. The colors are exhilarating. Sometimes life is strange. Follow my adventures!